I took remarkably few pictures while we stayed at Mokala, the newest in the collection South African National Parks (known as SAN Parks). Located fewer than 100 km southwest of Kimberly in the Northern Cape, visiting it felt like a gamble. The drive from the Eastern Cape and its green coastal thickets, through the wide and dry Karoo, was lengthy, there would be no exciting large predators (although I hoped to see the elusive black footed African cat, a little sweetie that looks just like a tabby house cat), we only had my cousin Andrea's well informed say-so for visiting, and I was nervous that it might not be worth the effort. The Frenchman has two weeks of vacation a year. They have to be good. But my first impression of the suddenly changed landscape, which was about the time I snapped Picture No. 1, above, through the Landcruiser's window, was intense. "This is good," I thought. In the driver's seat, Vince was smiling. Praise the Cousin. 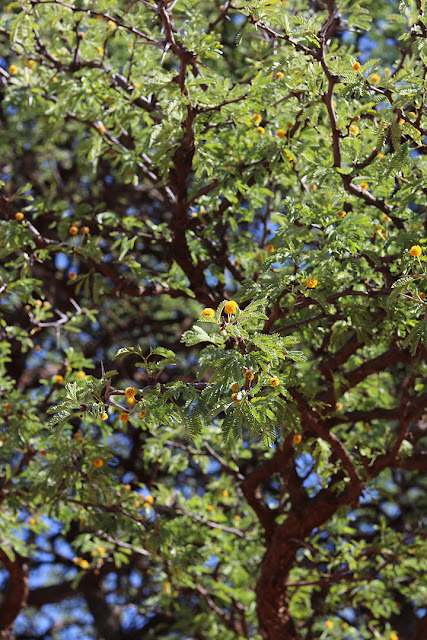 Every since we camped beneath the grand old camel thorns (Vachellia erioloba) of Namibia we have loved them. And Mokala was littered with these slow growing trees, acacia lookalikes whose dignified silhouettes sing Africa. Mokala is the Tswana word for camel thorn. Many southern Africans know the tree mostly as the best firewood - its hard wood burns long, hot, and beautifully, and our Namibian trips also yielded bags of camel thorn braaiwood, usually labeled kameeldoring - its Afrikaans name - at every stop. I learned subsequently that the tree is protected. While you are allowed to collect and sell the wood with a permit, it is sometimes collected unscrupulously or illegally. The last hour of our drive had been rough. After being snarled in consecutive Stop-Go's on the arterial N12, we left the tar road per my directions, deviating from Google's route suggestion, and choosing secondary dirt roads that were technically shorter, but whose corrugations were the worst we have ever encountered. If I had any fillings in my teeth they would have rattled right out. But at the very end we were rewarded with sand tracks like red velvet carpets. We had arrived. 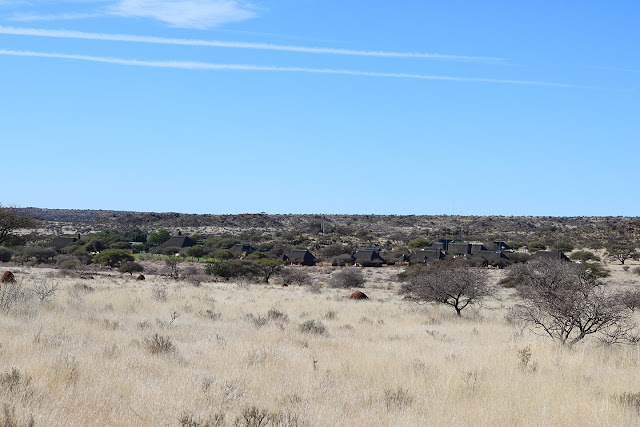 We checked in at the main rest camp, a discretely designed collection of thatched buildings with impressive lightning conducting poles rising high above its rooves. This is thunderstorm country, but at the very tail end of winter the summer rains had not arrived, yet, and the veld was still brittle and blond. 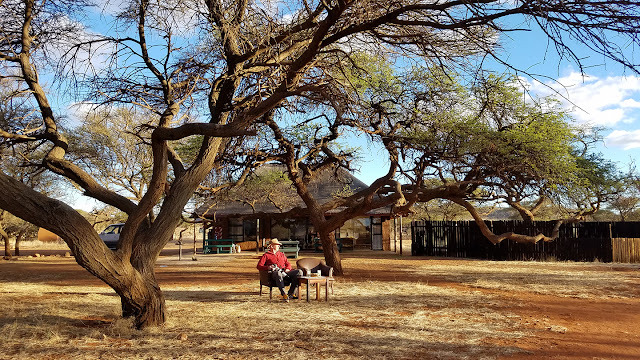 The warm and unaffectedly friendly greeting at reception was in stark contrast to the utter apathy we received all round at Addo Elephant National Park. It was such a relief. From the main camp we drove slowly to our isolated cottage (also Cousin Recommended) several kilometers away, passing through a fascinating landscape pattern en route. 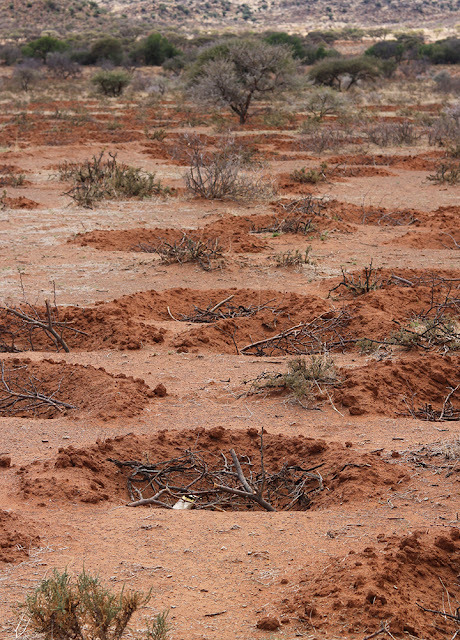 Some of the national park is comprised of former farmland that had been over grazed. I assume this mysterious series of excavations is about soil rehabilitation. Make a hole, pile in brush, wait for rain, rain falls and gathers, collected seeds germinate, covering the exposed and vulnerable soil? 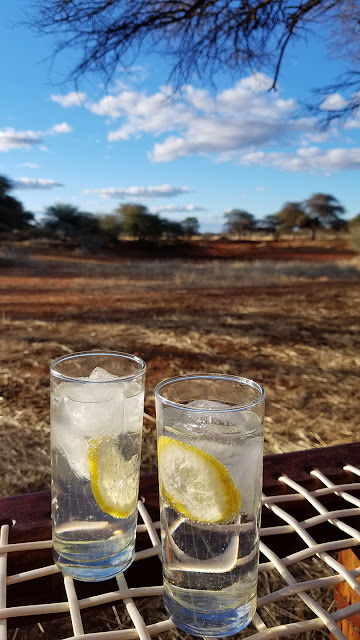 We unpacked the Landcruiser, made ourselves at home, poured the ritual gin and tonic, and took deep breathes of clean air. We kept our eyes peeled for buffalo (not an animal you want to surprise in the bush). 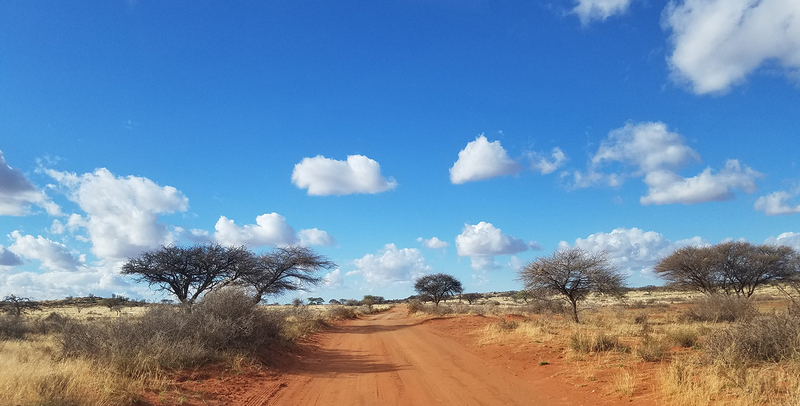 At Mokala you do the traditional park drive every day, choosing your route and stopping to look at the animals on the way. It is always like a treasure hunt. I left all the critter photography to Vince, content to drive or just look. 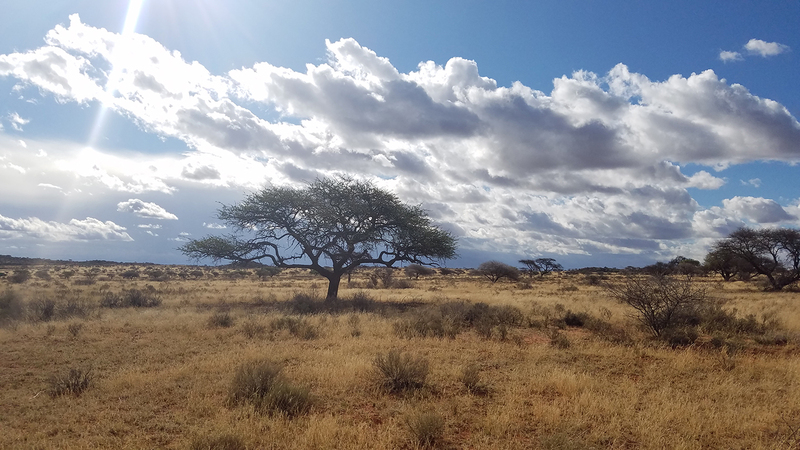 There were many giraffes, and we saw rare antelope like tsessebe, roan and sable. My favorite animals were the little mongooses that lived near the house, and one evening an enormous hare with backlit pink ears sat tamely eating a blade of scarce green grass beside our porch. A sweet scent late one afternoon led me to the flowers above, belonging to a black thorn tree (Senegalia mellifera). While Haak en Steek's location is stunning, the cottage itself needed - needs - some improvement. 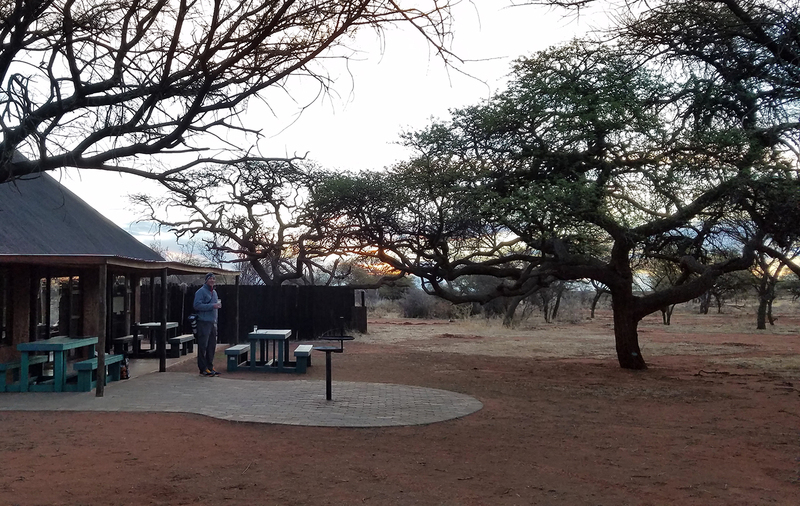 I made the very simple move on day one of carrying outside two comfortable chairs (we took them in every evening to protect them from dew, and vervet monkeys). The only other seating outside was a trio of incongruous and very ugly picnic tables which would be better suited to a rest stop, rather than not-inexpensive accommodation, as well as a stack of even uglier cheap white plastic chairs. A place like this invites repose and contemplation, neither of which can be done from bad seating. Good outdoor furniture is essential, for practical as well as aesthetic reasons. So there we sat under the camel thorns and their opening buds, and said and did very little. 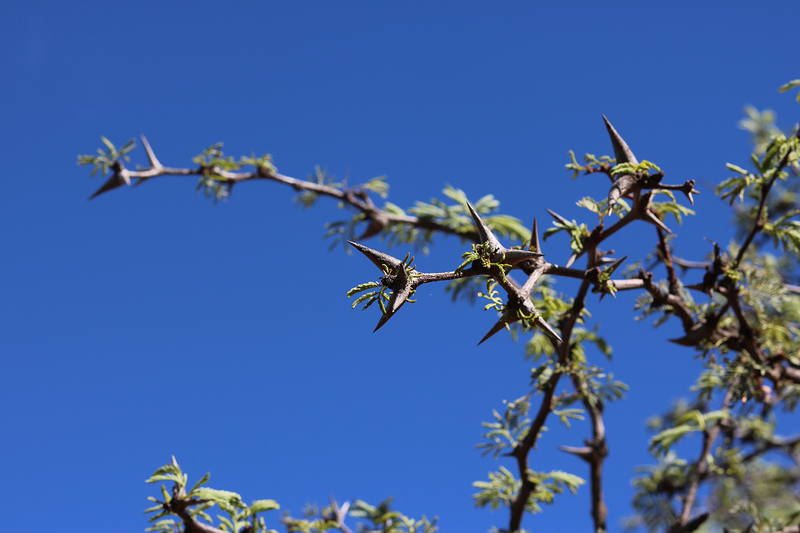 Giraffes feed voraciously on these thorny branches. They must have interesting tongues and lips. At the end of each day we sipped our drinks, resting on a borrowed riempie bench from inside. 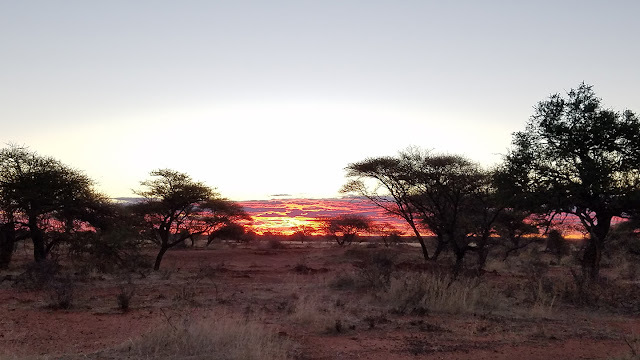 A herd of black wildebeest galloped into the dam one evening, stopped abruptly, dropped to its knees, drank from the trough of fresh borehole water that is provided in dry times, and galloped back out, like cowboys in a Western. We both burst out laughing. 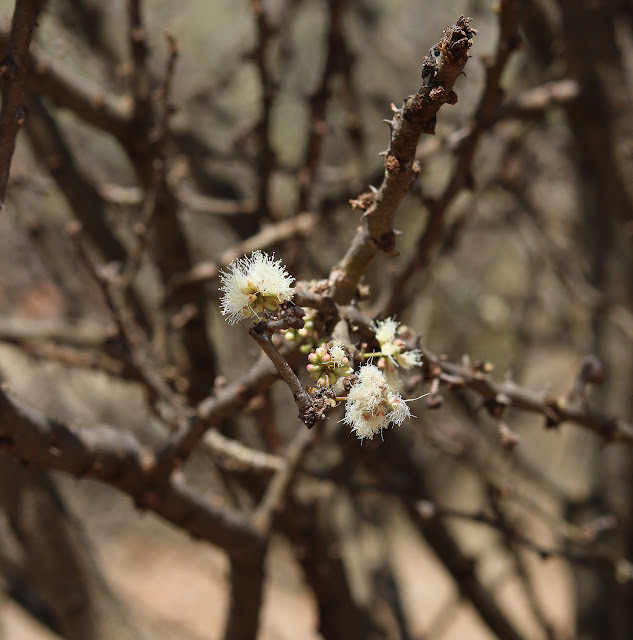 Another time we saw a male kudu drinking, once a trotting and thirsty jackal, often a lonely springbok, and every evening the bokkie eating fallen camel thorn blossoms under the trees. 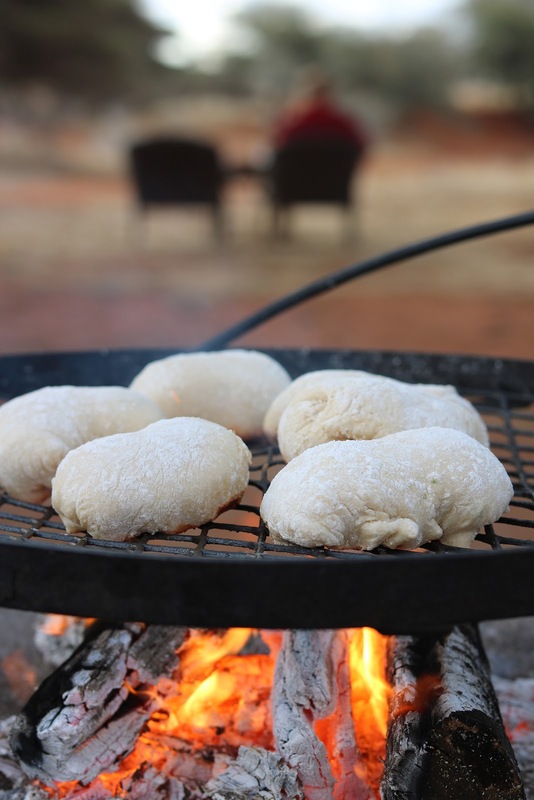 I made roosterkoek one night, cooking the dough over the coals. 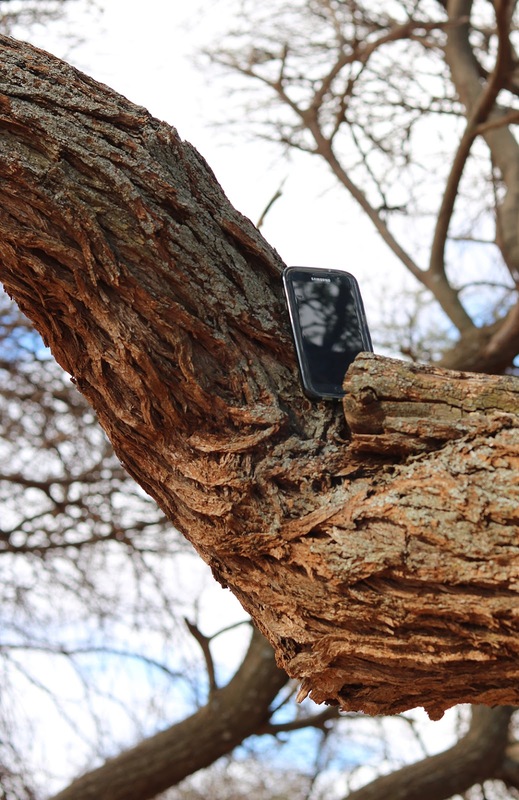 While it baked I caught some cell signal on a high branch. How else was I supposed to post to Instagram? 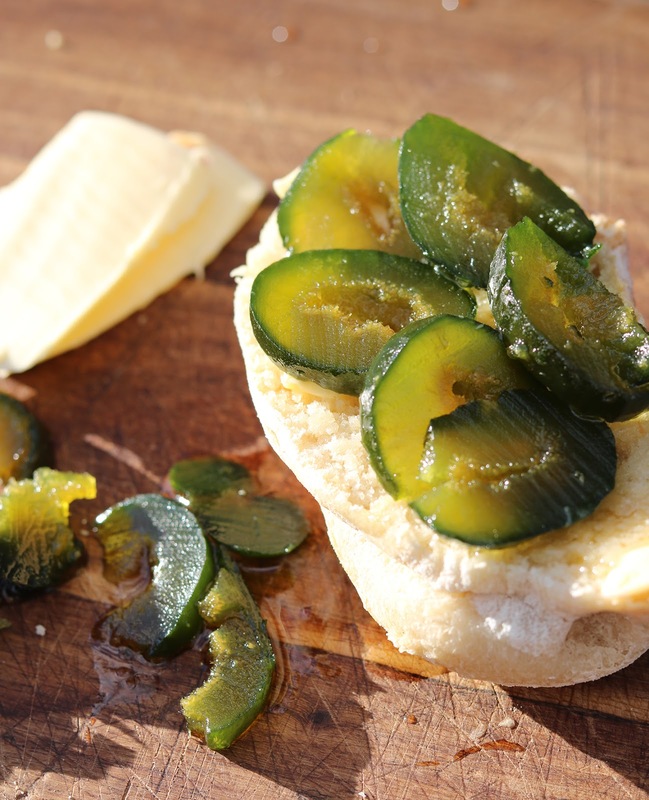 The best way to eat hot roosterkoek is with butter and green fig preserve -thornveld hors d'oeuvres. And while the next course of chops and boerewors grilled, its deliciously scented smoke wafting through the trees, we watched the sun go down, three nights in a row, and wished quietly for more. So that is my Mokala post. Its brevity belies the place's special appeal. We loved every minute, despite some idiosyncracies. 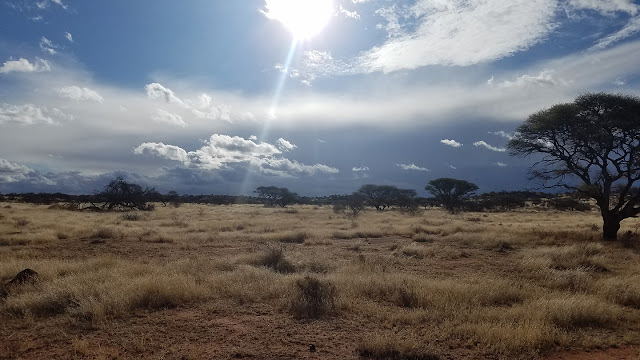 The cottage needs TLC, but the things that mattered were there: snow white linen, clean towels, a place to braai, friendly voices when you needed them, endless space, and the deep silence and crystal night sky that I will always, always associate with South Africa. Thank you for this lovely post. Our deep freeze in Vermont has finally broken, but this peek into the beauty of Mokala has warmed me as well. You deliver the most effective vicarious therapy. Thank you. What a beautiful experience you had. Thanks so much for sharing it.